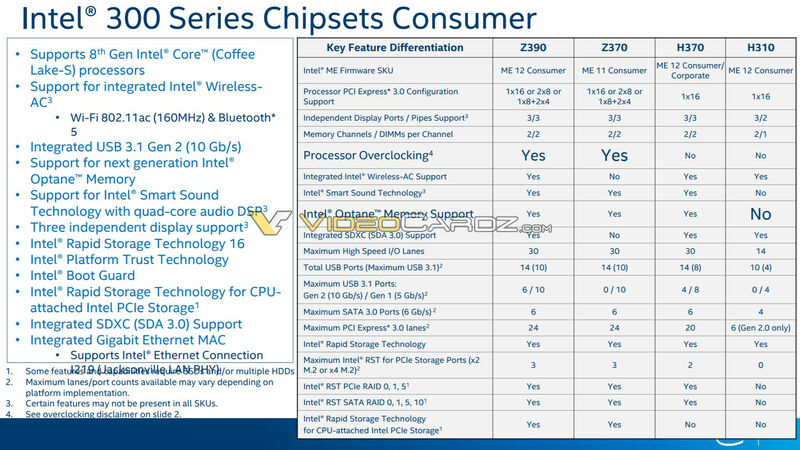 The newly leaked roadmaps show Z390 chipset replacing Z370 this quarter. Intel’s own roadmaps confirm Z370 chipset going for retirement soon. The new chipset brings a handful of new features such as USB 3.1 support and optional Wireless-AC support. Nothing that should be considered groundbreaking though. In fact, some motherboard manufacturers tell us it is basically a renamed Z370. This new enthusiast chipset was designed with future 8-core processors in mind, currently known as 9th Gen Core Coffee Lake-S series. The roadmaps that we are showing you today are clearly outdated. The 8th Gen Core series will be succeeded by 9th Gen Core series, which have already been officially confirmed by Intel. These roadmaps lack any reference to 9th Gen Core series. Same applies to X299 platform. The roadmap for upcoming HEDT series lacks Cascade Lake X for LGA3467 socket, which have already been demonstrated at Computex this year. Basin Falls Refresh would, therefore, be a Skylake-X Refresh, which might have been abandoned at this point. Or maybe, we get both?